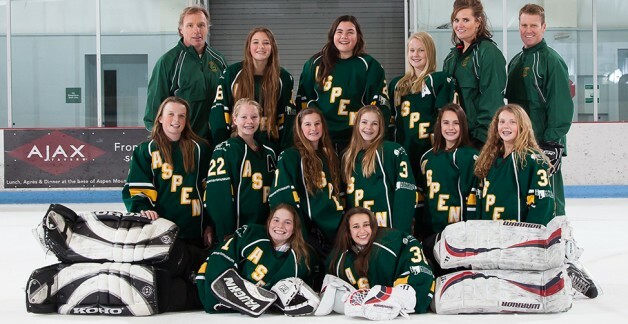 Sometimes it’s not easy finding appropriate developmental opportunities for girls, especially in Colorado’s mountain towns, but Aspen Junior Hockey (AJH) is making it work. A perfect example is its newly created 14U AA team, which sprung to life this season with players being underwhelmed, competitively, at the 12U level and overwhelmed at 19U. AJH hockey director Shaun Hathaway said that when it was announced last summer a 14U AA team was in the works, the number of girls who came out for tryouts was staggering – so much so the Leafs actually had to make cuts. “We haven’t had to do much of that – if any – in the past, but it was a healthy process,” said Hathaway, noting that close to three teams’ worth of girls showed up to audition. “Those who didn’t make the 14U AA team went to our 14U A team with an eye on making the AA team next year. “We decided as an organization to mimic how boys teams run tryouts. We had exit interviews with each and every girl and told them what their strengths were, what they needed to work on – that sort of thing. The tryout process was just the beginning of what’s turned out to be an exceptional season for the girls and their families. This season’s inaugural 14U AA team includes: forwards Sasha Brucker, Elsa Cassidy, Rachel Potoker, Juna Rettig, Stella Scott, Tobey Tick, Lara Trulove and Katie Yocum; defensemen Hannah Feder, Kaelin Harris, Charlotte Howie and Ava Ostrander; and goaltenders Anastasia Ferlisi and Julia Krys. Coach Emily Knutson leads the squad with help from Keith Howie, Coley Cassidy and Hathaway. Knutson is a former college player, having skated one season at the NCAA Division I level for Clarkson University in 2003-04 and then two years with the St. Olaf College’s Division III team from 2004-06. Prior to coming to Aspen, she helped coach at St. Olaf and at the North American Hockey Academy for the program’s 19U AAA girls team. Having Knutson lead the 14U group as head coach is a big score, says Hathaway. “Emily moved to the area to work as a ski instructor, so we got in touch with her and she was more than happy to come on board,” Hathaway explained. “With her experience, we’ve been able to ramp up our program in all facets – from the rec teams to the competitive tier team. And Hathaway is nothing but excited for what the future holds for the group – and girls hockey, locally. “We always have to keep growing the base, but the core of this team will be back next year; we’re only losing one player who’ll age out,” said Hathaway.